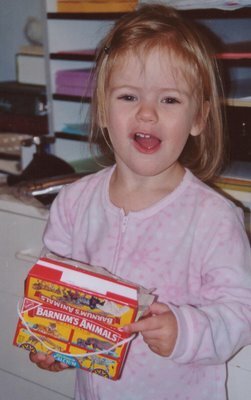 At Calvin’s shower in October, Maggie got a gift as well – her first box of animal crackers from Mrs. Uncle Jim and Esther. She loved eating them, but loved the box even more. She carried it as a purse until it fell apart. Fortunately she has just received a new, orange knitted purse from Annie Grook – pictures to follow. Awww… these pics are sooo cute! We just had our first summer camp meeting, and I can’t wait to see you again. Email me sometime inbetween feedings, changings, and everything else you are busy with.